Same contours and hard-molded polymer construction as the original MOE Grip. 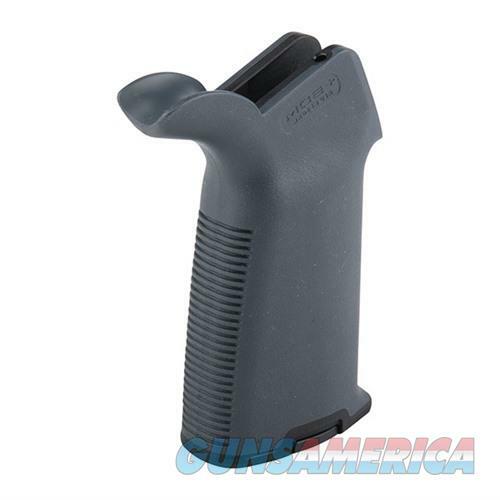 Durable, economical, easy-to-install replacement for factory pistol grip that gives the shooter a solid, secure grasp. Rigid, fully supported one-piece construction from the same reinforced, high-impact polymer as the MIAD grip, with crackle texture on the sides and deep horizontal grooves on frontstrap and backstrap. Curved beavertail similar to the MIAD B2 insert fills the grip-to-receiver junction to help you maintain a comfortable hold and protect the web of your hand during sustained firing. The MOE+ Grip has the addition of an anti-slip overmolded rubber coating for enhanced weapon control in wet conditions or when hand is sweaty. A polymer cap storage secures small items inside the internal compartment, and the MOE+ accepts Magpul MIAD grip cores (sold separately).